Worm Power Liguid and Granular Worm Castings are Vermicompost (Worm Castings and Worm Worked Materials) that have passed through a worm, and through which a worm has passed. Having thus been processed by worms, it is inoculated with a beneficial microbial community that is essential to establishing and maintaining healthy soils. Weed seed and pathogen free. University tested (Cornell, Penn State, Cal-Poly). OMRI listed for use in Certified Organic Production. Reduces need for synthetic fertilizers and fungicides. How Is Worm Power Liquid & Granular Worm Castings Different From Other Vermicomposts? Worm Power products are the result of recognizing that nature already has devised a means of soil enhancement that far exceeds the solutions offered by conventional methods. We have harnessed the power of tens of millions of earthworms, placed them in ideal, environmentally controlled conditions, and produced the finest quality bio-stimulant available. Worm Power is the largest process-controlled producer of worm-worked materials and castings (vermicompost) in the Western Hemisphere. We are committed to delivering the highest quality vermicompost available anywhere to growers, golf course superintendent and landscapers. Our science-based, research-supported process produces an environmentally safe organic bio-stimulant that improves the physical structure, chemical composition, and biological activity of soils and soilless medias. Unlike a typical “compost tea” that is “brewed” and must be used immediately, our Liquid Extract is a stable product that is elemental in nature and may be stored and used as required. Worm Power is OMRI listed for use by certified organic producers and turf professionals. Worm Power is derived from only a single source of compost for the vermicomposting process, helping to ensure an end product that is consistent, uniform, and repeatable. Thermophilic Composting & Monitoring: The raw materials are composted indoors within controlled, engineered, aerated static piles. This high temperature thermophilic composting step is completed prior to all vermicomposting. Compost batches are monitored daily to ensure that temperatures are maintained between 131-170°F for a minimum of three consecutive days, and that adequate aerobic and moisture conditions are met. Vermicomposting Method: Engineered flow-through digesters are a critical component of the Worm Power vermicomposting process. These digesters, which host millions of earthworms, are located in environmentally controlled, enclosed buildings that actively maintain a regulated living environment for a healthy worm population. Screening & Packaging: Finished vermicompost and worm casting products are screened to a variety of uniform particle sizes for ease of handling and consistent performance. Worm Power is screened, packaged, and stored indoors. Worm Power uses independent labs, including those at Cornell and Penn State Universities, for lab testing of feedstock, feedstock components, and the finished Worm Power vermicompost. 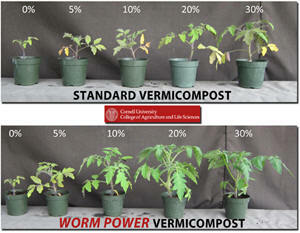 Cornell University has been studying the properties and efficacy of Worm Power for more than six years. 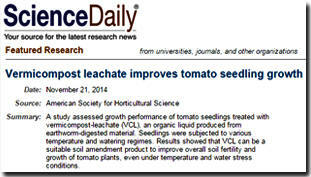 Findings from these studies include evidence that the use of Worm Power enhances plant growth. Experiments evaluating multiple organic media components in greenhouse seedling production have demonstrated that mixes containing Worm Power vermicompost produce the strongest, most vigorous plants. 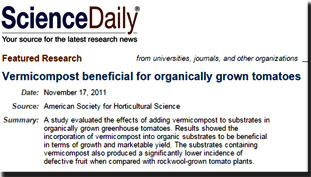 Additionally, researchers note that vermicompost can successfully be used as a sole nutrient source for vegetable and flower plug production. • Double wonder of worms: Clean compost and animal feed from waste. Established Turf: Apply 20 lbs per 1000 sq. feet twice per year (early spring and late fall). For best results, apply using a drop spreader. Pre-Planting: Work 30 lbs per 1000 sq. ft. into top 6” of soil. Established Planting: Top-dress planted area with 1/8” to the drip line of the plant canopy (Heavy feeders: every two weeks; Light feeders and Ornamentals: every 4 weeks). Turf Applications: Apply 3-5 gallons per acre every 3 weeks. For best results with turf, our Liquid Extract should be used as a part of a program that includes two seasonal applications of WP Organic Select (Granular) – one in early Spring plus one in late Fall. Standard Soil: Apply 1 oz (approx. 30ml) per gallon of growing container size every week during the growing season (If plants are in the ground, estimate volume size of root ball in gallons and apply accordingly). Soil-less Media: Apply 1.75 oz (approx. 50ml) per gallon of growing container size every week during growing season. • 1 Cubic Yard Sack(900 lbs or 22.5x 40 lb bag equivalent). • 2 Cubic Yard Sack (1,800 lb or 45x 40 lb bag equivalent). 100% Vermicompost (Worm Castings and Worm Worked Materials).